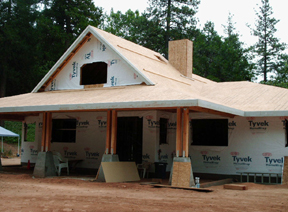 ...are YOU planning on building, remodeling, or adding onto your home? irst, let me say, I've been there! After 20+ years in the design trade, I had the joy of designing a house from scratch that will, God willing, be the last home I live in. For my own project, I utilized my 3D (three dimensional) space planning software to layout each and every room to scale, including placement of all key furnishings (e.g. furniture I owned as well as planned purchases). As a direct result of this careful advance planning, we had ZERO change orders throughout our actual build. Not only does this represent a significant cost-saving for the process (ask ANY contractor if you're not familiar with the headache$ of change orders); but, more importantly, my house functions as well as looks the way I intended. As Owner/Builders, I was actually the general contractor for the job which meant I sourced every single item and hired and scheduled all the various trades. Alas, I have met with many homeowners who called me once their house was already framed and it was obvious at that too-late stage that a given room simply wouldn't accommodate the furniture they'd envisioned -- what a disappointment given the enormity of such an undertaking! So, to summarize, I am available as a RESOURCE for you during whatever phase of the project you need assistance -- I work with new construction clients as much or as little as desired and feel I can be especially of service to fellow Owner/Builders given my personal track record in the homebuilding trenches. You can view my quotes here or view the .pdf in case the link moves. I was interviewed for a nationally syndicated article by Chicago Tribune writer, Leslie Mann, entitled, "Setting Your Sights on the Right Site". You can view the link here or download the [large file size] .pdf. 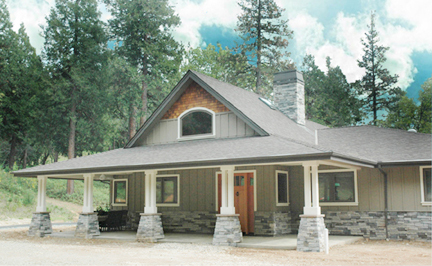 I was interviewed by BobVilla.com for an article entitled "Should You Custom Build Your Home?" 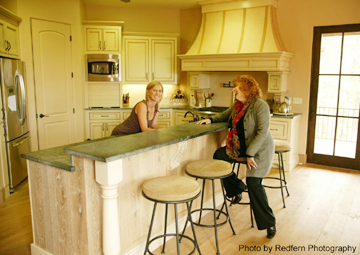 With my client, Christine Kirks (left), in her newly-completed kitchen. Click here to see enlarged photo (NOTE: will open in new browser window). ensuring traffic patterns are sufficient for day-to-day living, that doors don't bump into furniture, an open appliance door doesn't create a hazard or not open at all, hallways are sufficiently wide, etc. After all, the goal is the creation of a very livable space. ...as well as defining demarcations in between rooms, often a tricky task that trips up many homeowners going it on their own. These intersections between rooms are a key but often overlooked element -- until the last minute when some flooring installer pesters you to decide in 5 minutes so he can finish his work. [eventually] placement of all furniture, art, etc. There's a dazzling universe of products out there so it's also important to realize that if you're using a general contractor, he is liable to only show you a small selection of choices (e.g. "here are 3 faucets, pick one."). In reality, virtually everyone you'll be dealing with on your project will have a $take in your decision-making. Frankly, that's one of the best parts about working with me -- I do NO retailing whatsoever so I am most likely the ONLY person who will instead tell you what I feel is solely in the best longterm interest of your home....as well as your wallet. Review #2 of 3, several months further into their construction process. Review #3 of 3, written at the conclusion of their home's construction, after moving in. This now-completed home was recently featured in an article of mine for The Union on 4/16/2016 (article will open in new browser window). 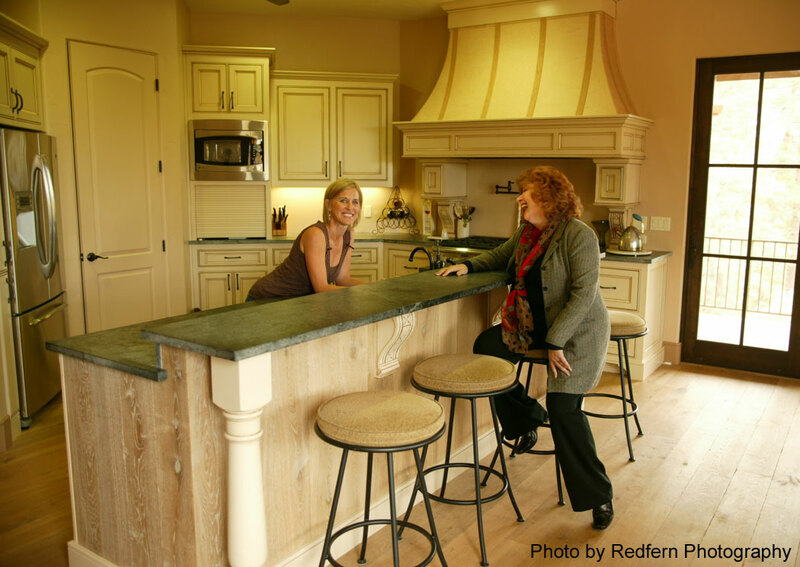 "We are midway through a house building project, and Sam Jernigan of Renaissance Design Consultations has been so expert, insightful and gracious as we confront one design decision after another. Sam's background includes a great deal of theoretical knowledge about color and design. She is systematic in explaining how color choices should be made; for instance she guided us through choosing our exterior home colors by having us choose our stonework and roofing first. She doesn't just recommend an option or color; she explains her ideas within a context of what works best, and why. She is confident in her recommendations, but she also honors our ideas and preferences. Sam is a true lifesaver because her expertise is helping us to design both the exterior and interior details of the house--a wholly daunting set of tasks for us. Sam is creative, and "thinks outside the box" when confronted with an interesting design challenge. She came up with a lovely kitchen design that would help to de-accentuate its proximity to a common area with a much higher ceiling and better light. She knocked out a CAD rendering of the space in record time, and worked with us on refining our choices. We never would have come up with those solutions on our own. Sam is helping with all aspects of design as we build our home. She is a consummate professional--flexible (sometimes home construction decisions have to be made quickly), punctual and completely transparent about fees. Germane to that, she is also very helpful in suggesting in ways to save money on materials and furnishings. As she explains so clearly on her website, Sam has no economic incentive to "up-sell" her clients; what she is providing is design expertise, and that she does so very well. Finally, Sam is so personable and non-intimidating. She interacts with cheerfulness and kindness, even on very hot afternoons thanks to a recent heat wave! She quickly responds to phone calls or emails, and makes us feel like she really is so happy to help us. We expect to be working with Sam through this year, and I will be happy to review her again once our project is finished. I do recommend her without hesitation." "One of the best parts for me of working with both you and Roy (her contractor) was that you broke the project down into small parts. I found too many "things" on my plate at one time overwhelming for a newbie to the building process. Having those small increments (i.e. "homework") made for an orderly process rather than an overwhelming list right off the bat." A major remodel created a new Master bedroom & bath retreat for the Hessel family of Lake Wildwood (Penn Valley). 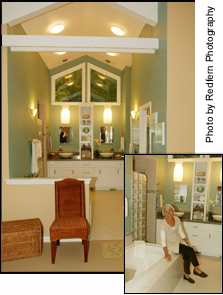 For this project, I helped Janet and her husband space plan as well as providing guidance on selection of cabinetry, bath fixtures, lighting, tile, countertops, sinks, flooring, and paint colors. [NOTE: by design, renderings are "stripped down" to their core elements vs. fully accessorized as these are primarily a visualizing tool for homeowners -- and skipping this last step reduces the cost of these renderings for my clients. 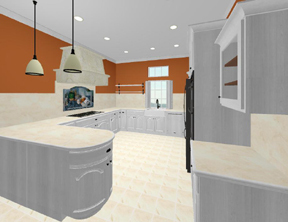 "We loved the kitchen designs!" As was the case for this project above, significant re-working of the space is reflected in these initial designs which incorporate specific requests from my clients and entailed removing and relocating an oddly placed pantry on the main focal wall as well as sealing up an unnecessary second entry to the adjacent formal dining room -- e.g. what good space planning's all about! (FYI, the clients approved this initial draft concept and are now proceeding in implementing this design as rendered).